On 11 February 1929, the steel screw turbine Belgian State Railways cross-Channel fleet steamer, Ville de Liege, sank in Dover harbour. The origins of the catastrophe were set in motion some 400 years before! 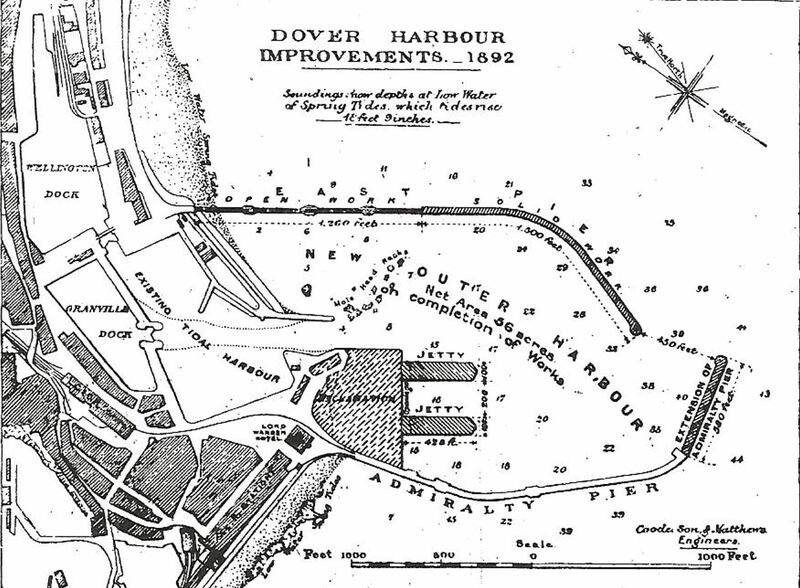 Up until the end of the 15th century, Dover’s harbour was on the east side of the bay. However, by the time of Henry VII (1485-1509), it was silted up and a new harbour had been built on the west side of the Bay. This, Dover mariners called ‘Paradise Pent’ as it met their needs. Sadly, by 1532, Paradise Pent was too small and was also suffering from silting. Sir John Thompson, minister of St James’ Church, wrote to the new King, Henry VIII (1509-1547) on behalf of four Jurats (senior councillors), with a plan to improve the harbour. The King responded favourably with £300 and as a reward Sir John Thompson was given the position of Master of the Maison Dieu. Thompson was also appointed engineer and work on the new harbour began on St Anne’s Day, 26 July 1533. 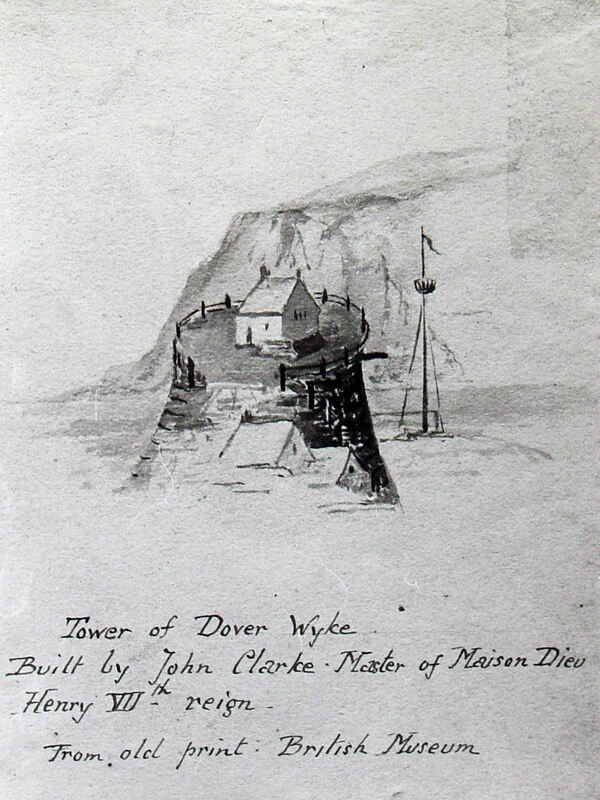 Although Henry approved and promised to pay, when the costs reached £50,000, the King’s accountant for the Dover project, Anthony Aucher (d.1558), suggested that it should be brought to a halt. By that time, except for the breakwater, the project was complete. Although the breakwater head mole was finished the wall between it and the harbour was only 18 feet (5.5 metres) high. On spring tides, it did not present a problem until ships of greater depth were introduced and from that time, what became known as the Mole Head Rocks, were a constant problem. However, the ‘isolated’ head mole – the Wick or variously called the Wyke, King’s Foundation, Mole Head Rock and Moule Rodd, caused more. Over the subsequent centuries, the harbour grew and there were many modifications including the building of the Admiralty Pier, which was finished in 1871. Some twenty years later the Commercial Harbour was started with the building of the Prince of Wales Pier in 1893. 2,900 ft long (884 metres), the Pier opened in 1902 and the Admiralty Pier was extended from 2,100 feet (640 metres) to 4,100 feet (1, 250 metres) when the great Admiralty Harbour was built between 1898 and 1909. Throughout these grand schemes, no attempt was made to remove the Wick, which was between the new Prince of Wales Pier and the extended Admiralty Pier. On the inside of the Admiralty Pier, facing the prince of Wales Pier, was the then Number One ferry berth. 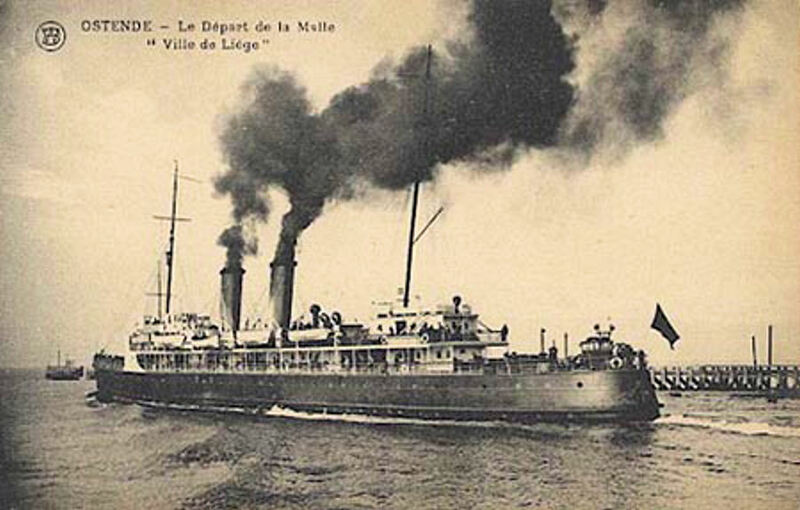 The Ville de Liege was a small mail steamer of 1,500 gross, built by Cockerill’s of Hoboken, Belgium and launched in 1914. Not long after World War I (1914-1918) was declared she was commandeered for war service as a troop carrier. Her main role was bringing the wounded back from the Western Front. Following the declaration of Peace, she was the first Belgium ship to return Belgium expatriates to their homeland. The little ship was then returned to Belgian State Railways for the service between Dover and Ostend. By then, however, she had earned the notorious accolade that she was unsteady in rough weather. Western docks showing the Admiralty Pier, Prince of Wales Pier the Tidal harbour entrance with the Mole Head Rocks to the east. At about 19.30 hours on the evening of Monday 11 February 1929 a north-easterly gale was blowing when the Ville de Liege attempted to get along side the Number One berth on the Admiralty Pier. She had 48 passengers on board and they were coming on deck in readiness to disembark. It was low tide when the Ville de Liege was suddenly struck heavily by waves on the port side quarter. This sent a shudder down the ship and the lights went out. The ships siren was sounded and a distress flare released. The force of the waves made the Ville de Liege change direction and she was driven onto the Mole Head Rocks / Wick. Luckily, she finished broadside on to the sea so the crew could lower lifeboats into the comparatively calm waters on her port side. The rescue was undertaken in total darkness and the cutting wind was driving sea spray that froze in the passengers’ hair and on their clothes. Due to the ice forming on the rope ladder the passengers found it both difficult and frightening descending into the ships lifeboats. The Dover lifeboat, William Myatt , Coxswain Colin Bryant, came to the help but still the whole process was very slow. It took three hours but surprisingly, there was little panic. Although most lost their luggage and one person their car, none of the passengers were injured. Captain John Iron, Harbour Master, asked the Military officer in charge of the Searchlights on the Admiralty Pier to switch them on. He belonged to he 3rd Company of Royal Engineers and was a stickler to rules. He refused until a higher authority gave permission but after a bit of cajoling agreed to telephone his boss. Much later the lights were turned on but the next day Captain Iron was sent a bill for 5d (2p) to cover the cost of the telephone call! Nonetheless, other members of the Company did come to the harbour and help with the rescue even though they did not have permission! Once in the lifeboats, due to the heavy seas, it took a long time to get the passengers to the shore. From there they were taken to the Marine railway station and given warm, dry, clothing, by the Seaman’s Mission, and hot tea. It was then that the ordeal that they had been through began to hit. 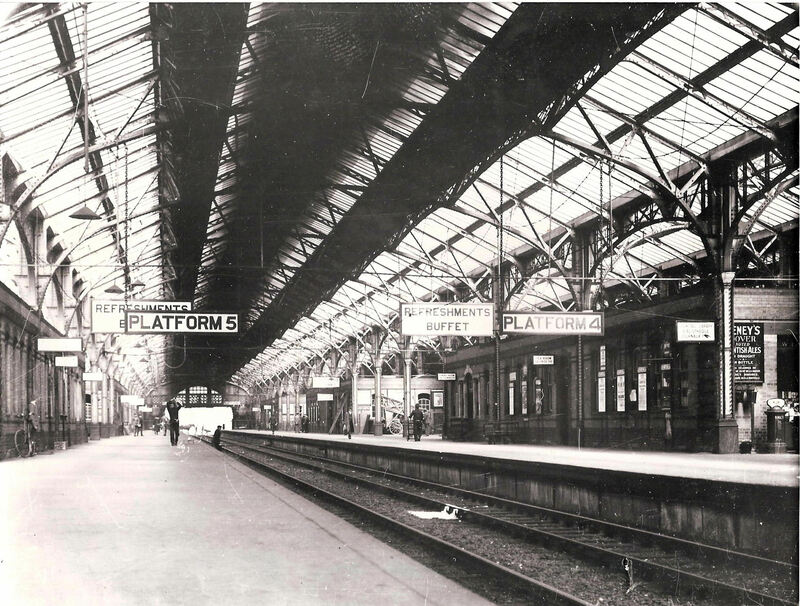 When the next train came in to London, the passengers boarded it and were looked after by the railway staff. However, when they arrived in London not only had they missed connections but also their possessions and in some cases most of their money. They were stranded, destitute and there was no help at hand. Eventually, some managed to contact relatives and it was they who took over the care of all the beleaguered passengers. 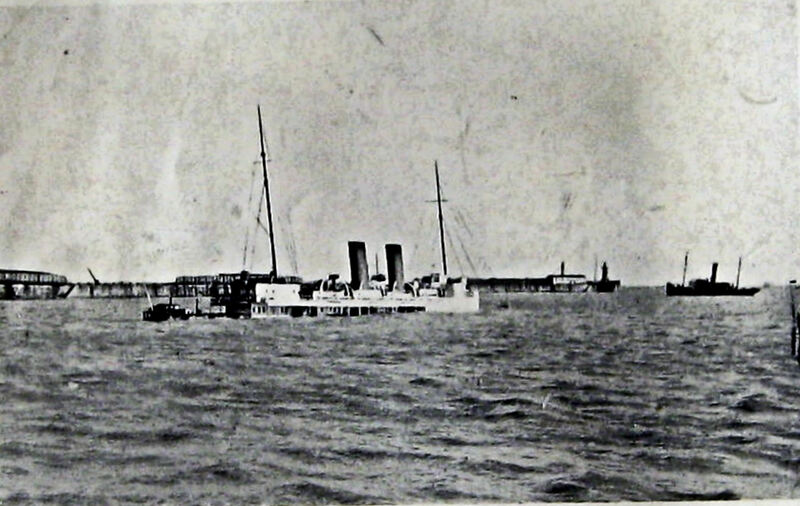 Meanwhile the Harbour Board tugs, Lady Brassey and Lady Duncannon, were alongside the Prince of Wales Pier but unable to get close to the Ville de Liege. A rocket was fired from one of the tugs so managed to get a rope on board the stricken vessel. However, it soon came clear that the Ville de Liege was badly damaged and was starting to make water. The tide was coming in and by 22.30 hours, she was listing so badly that the crew were ordered to abandon ship. The next day, although it was too rough to attempt to salvage the vessel, Captain Iron and members of the crew went on board. They found that all the cabins and holds, with the exception of the engine-room, were full of water. The engine-room was flooded to the level with the water outside and from this, Captain Iron surmised that the damage to the hull was in the engine-room. Conscious of his duty, the Harbour Master organised the collection of the mail that the Ville de Liege had been carrying to be salvaged – most was floating on the main deck! He then notified the postal authorities so that they could collect it. Over the next few days divers, under the supervision of Percy Sutton – the Harbour Board Superintendent of Works, plugged the holes in the hull of the Ville de Liege and pumped the water out. On 20 February she was towed, by Lady Bassey, into the Granville Dock, while Lady Duncannon and salvage tug, Dapper, were along side pumping out water. There the Ville de Liege was made watertight and on 8 March she was towed, stern first, to Calais so that full repairs could be undertaken in the dry-dock there. When these were completed the Ville de Liege returned to her homeport of Ostend and to working the Passage. She remained in service until 1936 when she was retired and was about to be sent to auction. However, in 1928, Captain Stuart Townsend introduced a fledgling car-carrying cross-Channel service and Southern Railway responded with the Autocarrier – the car-carrying ferry industry was born. The Belgium’s recognising that this had potential rebuilt and refurbished the Ville de Liege to carry cars. Taking less than six months, on completion she was capable of carrying 60 cars and 200 passengers and renamed the London-Istanbul. She was fitted with four doors on her starboard side to allow cars to be driven on and off at different states of the tide and commenced on the Dover – Ostend service 30 July 1936. Commandeered for war service, (World War II -1939-1945) the little ship was sent to Calais to serve as a hospital ship. On 10 May 1940, the Germans launched their offensive against France and the London-Istanbul returned to England. Converted into a minesweeper depot ship she was sent to the Scarpa Flow under the name of HMS Ambitious. She then went to Iceland as an accommodation ship, coming back to the UK for the Normandy Landings in June 1944. When peace returned, under the name of the London-Istanbul, she was the first Belgium ship to open up the Ostend passage, initially from Folkestone. Thus repeating her World War I triumph, when she was called the Ville de Liege! The little ship worked the Dover-Ostend passage until 1949 when she was chartered by British Railways Southern Region for their Folkestone-Calais car carrying service but was scrapped the following year. For their efforts in saving the Ville de Liege in 1929, Dover’s Harbour Master, Captain John Iron, was awarded the Knight of the Order of Leopold (K.O.L. ), and Percy Sutton, the Harbour Board Superintendent of Works, a Knight of the Order of the Crown (K.O.C) Belgium’s highest honours. This entry was posted in Ships, Ville de Liege - the shipping accident that was waiting to happen. Bookmark the permalink.